Former Democratic governor and senator from Virginia Charles Robb was planning to restart a memoir when he was asked to lead a presidential commission examining the intelligence community's flawed evaluation of Iraq's weapons of mass destruction programs. 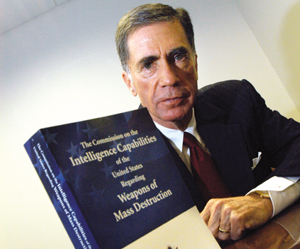 Robb and federal appeals court Judge Laurence Silberman co-chaired the Commission on the Intelligence Capabilities of the United States Regarding Weapons of Mass Destruction. The commission's report, delivered in March to President Bush, called for increased information sharing among agencies and use of advanced technologies in intelligence gathering. Washington Technology staff writer Roseanne Gerin caught up with Robb, 65, in the Arlington, Va., office where the commission staff worked, just as it was getting ready to close up shop. Robb discussed the commission's findings, including the role contractors can play in helping to improve intelligence gathering and sharing. WT: What surprised you about the commission's findings? Robb: I was surprised by the lack of preparedness across the community. ... I was aware that there were specific problems, I wasn't as aware that there were systemic or generic problems. Frankly, I was surprised that technology was not being used as effectively as I thought it was ... Even though the intelligence community has some of the most sophisticated equipment in the world, it is disconnected from some of the most useful open-source equipment in the world. WT: What was the most important finding? Robb: It's so simple that it doesn't sound all that important, but the community is insufficiently integrated. As we say in the report ... it is a community in name only. Now, it's moving in the direction -- and particularly in respect to some of the terrorism threats ? of being more integrated. But there are still too many parts of the community that don't speak effectively to other parts. WT: Are the problems related to technology or culture? Robb: It's a combination of both. The commission came to the view that technology was part of the problem, but it was solvable. The more difficult challenge facing us has to do with the cultural part and the resistance to change. The community had grown very effective at probing the targets associated with the old Cold War; it had not developed techniques, integration skills and communication skills that were ahead of the curve in enough different areas to deal with the effects of what we're challenging and will challenge. The fact is that, on the technology side, a lot of those who are our adversaries or potential adversaries are effectively using against us technology that was created in this country. WT: Which technologies are vital for information-sharing capabilities in the intelligence community? Robb: Almost anything related to the IT world that makes it possible to disseminate and to keep track of information. Whether it has to do with the speed, the security of what is the transmitted or [data]-tagging. ... And the integration of all of the technical advances that are possible with privacy and individual rights concerns are a legitimate part of the equation, particularly when you're dealing with personal information and particularly when it's U.S. persons, it has special ramifications. WT: What role should contractors play in introducing these technologies? Robb: It seems that government contractors can be both responsive to requests from the government and make suggestions to the government as to how they can better serve the [intelligence] collectors and, ultimately, the policy-makers. There are a lot of good ideas outside of government altogether. Some are commercial, some are think tanks, some are federally funded research and development corporations ? different areas where people with special skills and capabilities can assess needs and requirements in a way that may or may not reflect what's actually happening within various pipelines. The whole process needs to be more consumer-driven, and the professional government contractor community can do more to anticipate rather than simply respond to requests. ... It's something that the non-governmental part of the community clearly can anticipate and occasionally develop ideas on their own nickel, in addition to the sponsored research that's available to specific government contracts. WT: Will you ever run for political office again? Robb: No. There are some people who realize their life's calling being a member of Congress or the Senate, and they are very capable people. But it turns out ? and it did surprise a lot of people ?I was much more comfortable with being governor rather than senator.